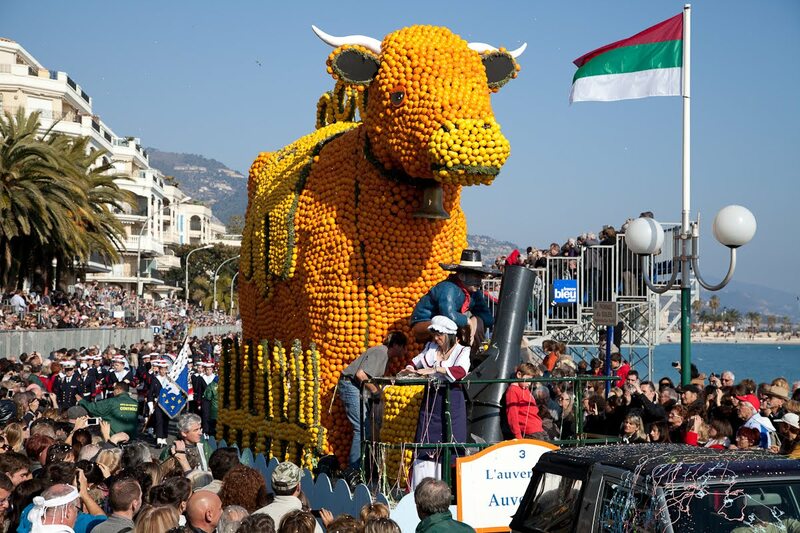 All the fun of the Fete du Citron with the cow from the Auvergne. This is a reputed breed called Salers which originated in the Cantal. A Salers cow can produce almost 3,000 kg (6,614 lb) of fat-rich milk each year of her life. The milk is traditionally used to produce Appellation d'Origine Contrôlée (AOC) cheese such as Cantal and Salers cheese. The last float represents the Rhone Alpes and Picardie and 'Guignol and Lafleur'. 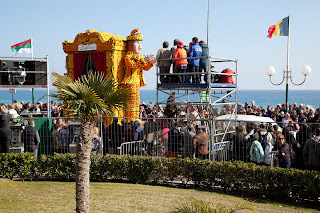 Guignol is a well-known marionette from Lyon and Lafleur comes from Amiens in Picardie. They don't normally appear together but each are as well known and loved by the French as Punch and Judy in England. Tout le plaisir de la Fête du Citron avec la vache d'Auvergne. C'est une race de vache réputée appelée Salers ayant son origine dans le Cantal. Une Salers peut produire près de 3.000 kg de matières grasses de lait par an. Le lait est traditionnellement utilisé pour produire des fromages d'Appellation d'Origine Contrôlée (AOC) tels que le Cantal et le fromage de Salers. love that glittering final shot. They add Vitamin D to milk in this country. 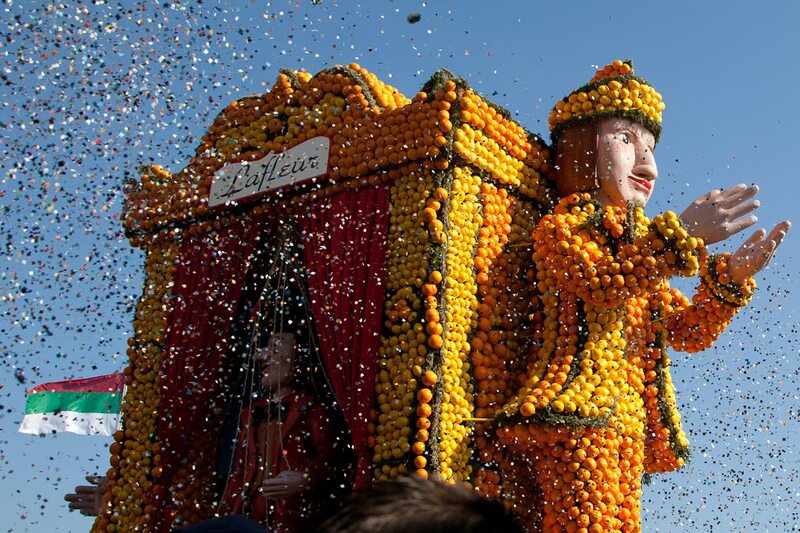 Apparently France likes some extra Vitamin C. What's that flag in the top photo? Your last photo, the close-up with the confetti, is tops! That's the flag of Italy, Bob - which, as you know, is about 5 minutes away from this scene. So, the Chinese press is taking interest in the event? I wonder if you'll see the effect on the Chinese attendance in the coming years? Amazing press platform - not very large but what a view !